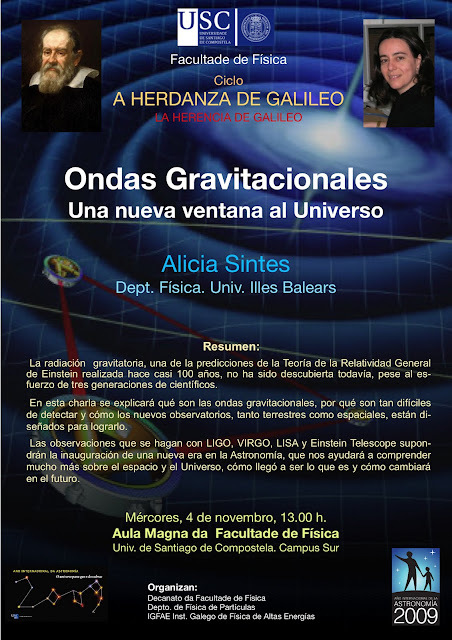 A little advertising for a seminar next Wednesday here in Santiago if you're around. A talk on the fascinating subject of gravitational waves and their detection which I'm told will be at the divulgative level. These experiments are truly spectacular in terms of their mind-boggling precision, measuring the length of a vacuum chamber several kilometers long when the distance changes by one-hundred-millionth the diameter of a hydrogen atom! These mammoth experiments are designed to detect the gravitational waves given off when extremely violent astronomical events occur, such as the merging of black holes (see the LIGO website and and VIRGO website for more details). One o'clock in the department of physics on the South Campus of the university of Santiago de Compostela (presumably in Spanish).